Before reaching this conclusion, John made a comparison with the film industry. Whilst the director is seen to be the author of a film, it’s often meddling studio executives who determine the final cut, and thus the quality of the film. Some directors are given a clause in their contract that allows them to have ‘final cut’ — the film they turn in is the film that gets released. In an era when no directors were given final cut, Alfred Hitchcock found a way to give himself final cut, and that is what I’m advocating today — finding ways to exert creative control and lessen the impact later decisions may have on the quality of the final product. 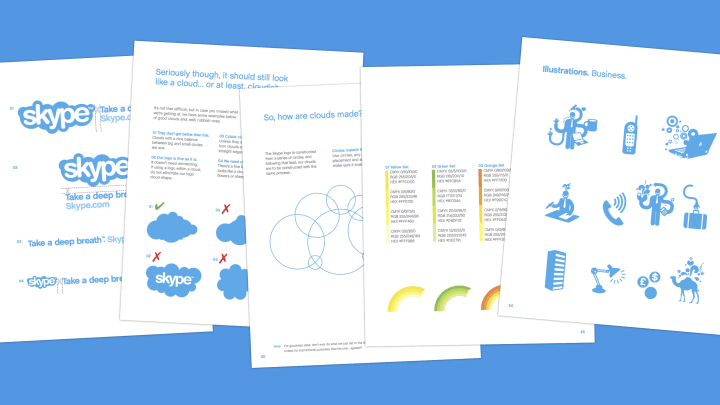 A selection of pages from the Skype styleguide. As a brand made up from a number of different elements (the logo, clouds, rainbows, illustrations and sometimes photography), it would be easy for the brand to become diluted should these not be consistently applied. Skype’s branding guidelines explain how each component is constructed before providing examples of these different pieces brought together. The visual styleguide, How We Look , is accompanied by a separate document called How We Think which focuses on messaging and tone of voice. 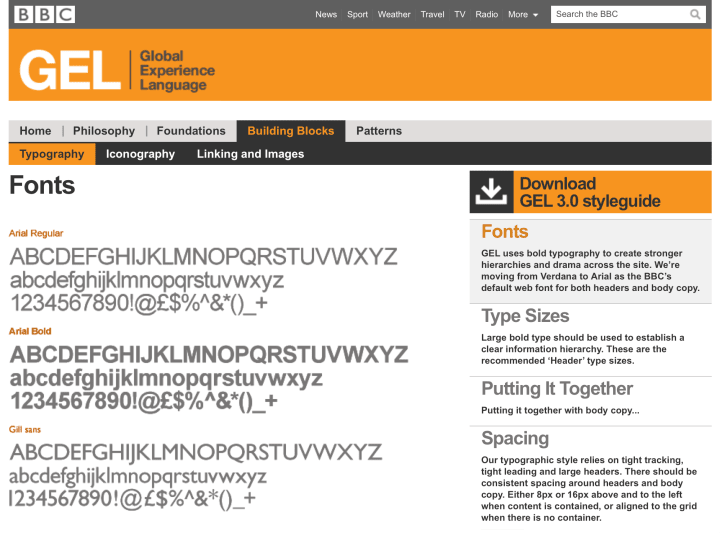 A page on the BBC website detailing the GEL typography guidelines. After many years being critical of the visual design of bbc.co.uk, GEL exceeded my wildest expectations, and I’ve been following the roll out of ‘gelled’ websites on a dedicated website ever since. Over time I hope to look in greater detail at how this visual design language has been adopted, but I’m also interested to see how the BBC manages to ensure conformity across the site whilst at the same time allowing enough flexibility to cater for different brands and design requirements. This is an approach I fully endorse, and one I’d like to see Clearleft — and other web design agencies — adopt too. The final point of handover is between a front-end and back-end developer. At Clearleft, rather than deliver an inflexible set of static pages, we present our code as a series of modular components (or pattern portfolio) that can be assembled into different configurations and page layouts as required, although we often provide a number of reference pages created from these components too. Such systematic thinking was instigated by Natalie, yet this is something we continually iterate upon; Jeremy now includes a pattern primer; a collection of markup snippets that can be used anywhere in a site. This seems very much in the spirit of Alfred Hitchcock. Whilst much of this talk has focused on the styleguide as a deliverable, I hope the underlying theme has been the importance of communicating the complexities inherent with an interactive medium like the web. Simply presenting flat image comps is by no means enough — it’s only the start.